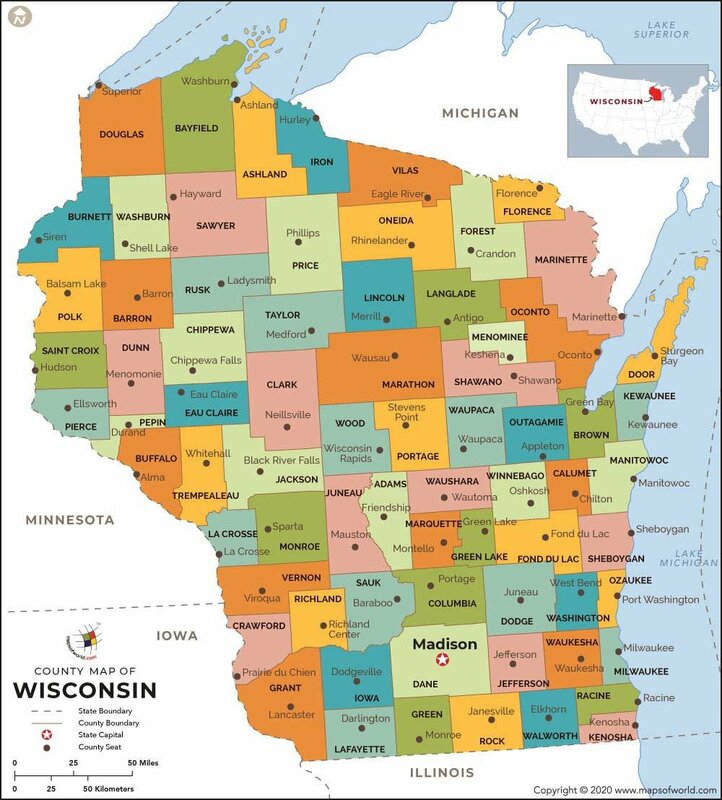 Wisconsin consists of 72 counties. Some of the major counties in Wisconsin are Adams County, Barron County and Door County. 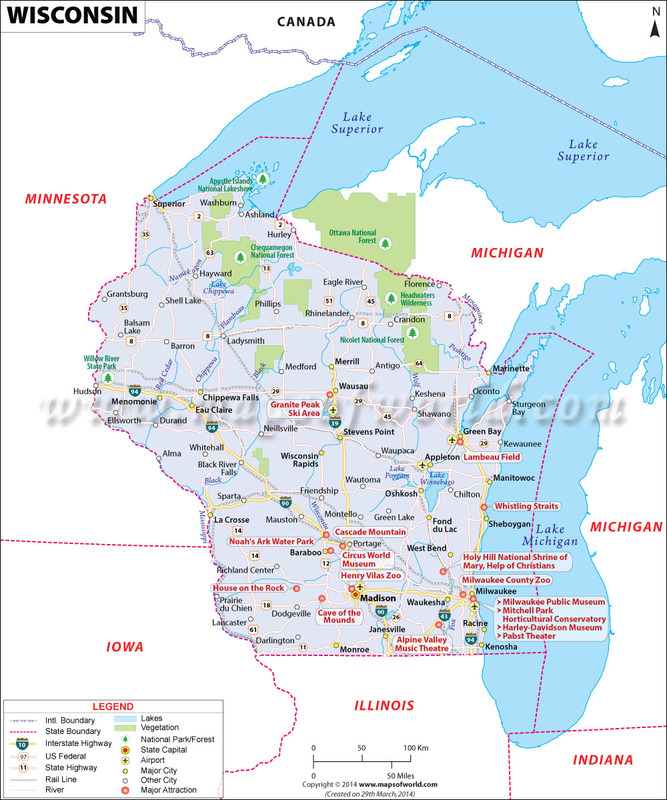 Wisconsin is the twenty-third largest and the twentieth most populated state of the US. The state is situated in the midwest, north-central, and the Great Lakes region. Wisconsin is also known as ‘America's Dairyland,’ since the state is one of the leading dairy producers in the country. The other major sectors of the state are tourism and manufacturing. Wisconsin has a diverse geography with parts lying in the western area of the state and the lowlands spanning the shores of Lake Michigan. The state is surrounded by Illinois to the south, Minnesota to the west, Lake Michigan to the east, Iowa to the southwest, Lake Superior to the north, and Michigan to the northeast. The state is segregated into 72 counties. Few notable counties of the region are Adams County, Door County, Milwaukee County, Dane County, and Barron County. The biggest county is the Marathon County, Pepin County is the smallest and Milwaukee County is the most populated one. Situated in the south-central area of Wisconsin, the Dane County offers a plethora of opportunities to its visitors like historical sites, museums, and state parks. Also, the capital of the state, Madison, is based in Dane County. The county also hosts an annual Dane County Fair. Wisconsin State Capitol, Tyrol Basin, Camp Randall Stadium, Monona Terrace, Cave of the Mounds, Lake Monona, Henry Vilas Zoo, and National Mustard Museum are some of the other spectacular places of the Dane County. Door County, an attractive motorcycling destination, is spread over an area of 2370 sq. miles out of which only 482 sq. miles is the land area and rest is all water. Door County has a long list of attractive places to boast of: 53 Lake Michigan Parks, 19 County Parks, 11 lighthouses, and Five State Parks. It is also a premier destination for kayaking in the midwest. The Schoolhouse Beach on the Washington is one of the five beaches of the world, which are made up of smooth white limestone completely instead of sand. Peninsula State Park, American Folklore Theatre, Potawatomi Park, Sherwood Point Light, Alexander Noble House, and Horseshoe Island are other prominent places to visit in the county. The Milwaukee County is the most populous county of Wisconsin. With the county seat being Milwaukee City, the county offers numerous visual delights to all its visitors. The Milwaukee Art Museum has more than 30,000 works of art encompassing folk and Haitian art, German Expressionist paintings and prints, and American decorative arts from antiquity to the present time. The museum annually serves more than 350,000 visitors. One of the largest zoos of the nation is the Milwaukee County Zoo, which is spread over an area of 200 acres housing nearly 2,000 birds, mammals, reptiles, fish, and amphibians in especial habitats. Other notable places in the Milwaukee County are Harley-Davidson Museum, Discovery World, Frontier Airlines Center, Marcus Amphitheater, North Point Lighthouse, Gesu Church, and Boerner Botanical Gardens. The Adams County in Wisconsin gets its name either from the second president of US, John Adams or the sixth president, his son, John Quincy Adams. Founded in the year 1848, it has a total land area of 689 sq. miles and the county seat is a village called Friendship. The county has the fourth and the second largest inland lakes of Wisconsin, the Castle Rock and the Petenwell Lakes. Bothe these places are known for swimming, fishing, and boating activities. Wisconsin Dells, Van Kuren Trail, Quincy bluff, and ADare Go Carts are other prominent places of the county. Marathon County is the biggest county of the state with the land area of 1576 sq. miles. Founded in the year 1807, Marathon is also the oldest county of Wisconsin. The county seat of Marathon is Wausau. Major attractions of the county are Rib Mountain State Park, Wausau School Forest, Athens Fair, Wisconsin Valley Fair, and Silver Creek Orchard. The Barron County, with the county seat as Barron City, is spread over an area of 890 sq. miles. Wildwood Resort, Northwood Shores, Crystal Lake Cheese Factory, Barron County Fair, and Pioneer Village Museum are some of its notable places. Wisconsin has almost eighty-five universities and colleges, which are recognized by the Carnegie Classification with the University of Wisconsin – Madison (UW-Madison) being the biggest public post-secondary institution. Other prominent universities and colleges are Marquette University, Western Technical College, Lakeshore Technical College, University of Wisconsin – Milwaukee, University of Wisconsin – Eau Claire, Gateway Technical College, and Blackhawk Technical College.